↑ "pothos.org - Major Battles". Archived from the original on 16 October 2007. สืบค้นเมื่อ 19 August 2016. ↑ Curtius Rufus also tells that, except for about 4,500 wounded, 150 Macedonians were killed in action, and 302 were missing. This means that the army had lost about one tenth of its strength. ↑ "Issus (333 BCE)". Livius.org. สืบค้นเมื่อ November 6, 2018. 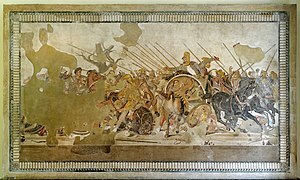 ↑ "The Battle at Issus". ThoughtCo. สืบค้นเมื่อ November 6, 2018. ↑ "Battle of Issus". Ancient History Encyclopedia. สืบค้นเมื่อ November 6, 2018. ↑ "Battle of Issus". Britannica.com. สืบค้นเมื่อ November 6, 2018.